Wisconsin Republicans, just weeks away from losing control of both the governor and attorney general’s offices, planned dramatic lame-duck votes Tuesday on a sweeping attempt to limit the powers of incoming Democrats, a move that opponents decried as a last-gasp power grab and attempt to invalidate the election. Once approved by the Legislature, the measures would head to Republican Gov. Scott Walker for his signature just five weeks before he is replaced by Democrat Tony Evers. Republicans maintained majority control of the state Legislature in the November election, and thanks to the rare lame-duck session, Walker has a chance to leave one final mark on the state after losing his bid for a third term last month. Evers, incoming Democratic Attorney General Josh Kaul, and other opponents urged Republicans to reject the measures. Protesters flooded the Capitol on Monday, chanting “Shame!” and occasionally disrupted the public hearing and a news conference with Republican leaders. The lame-duck maneuvering in Wisconsin is similar to what Republicans did in North Carolina two years ago and is being discussed in Michigan before a Democratic governor takes over there. The bills were moving quickly in Wisconsin, having just been made public late Friday afternoon. 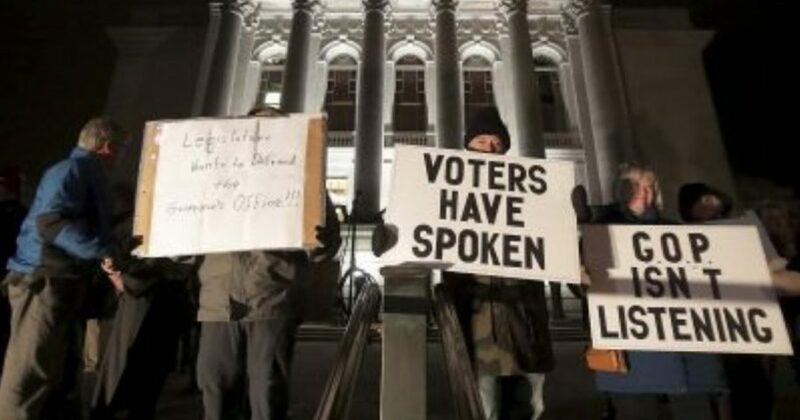 Walker signaled support for the moves Monday, and his office has been working with Republicans on crafting the package. Evers called the unusual lame-duck session “rancor and politics as usual.” The last lame-duck session in Wisconsin was in 2010 when Democrats tried unsuccessfully to enact labor agreements. The remaining proposals would weaken the governor’s ability to put in place rules that enact laws and shield the state jobs agency from his control. Republicans also want to limit early voting to no more than two weeks before an election. Such a measure would stop Evers and Kaul from fulfilling their campaign promises to withdraw Wisconsin from a multi-state lawsuit seeking repeal of the Affordable Care Act.